Chills, thrills, fire drills? While patrons aren’t usually required to take part in actual drills, fire safety is definitely a top priority for owners and managers of haunted attractions. Fire safety and a host of other concerns specific to the genre present unique situations. Certainly other entertainment venues are accustomed to having hordes of people trooping through but they don’t necessarily operate in the dark. Nor do they have ghouls and other creatures randomly popping out to scare the bejeezus out of people. All these factors make the job of keeping a haunted attraction safe for guests particularly challenging. Patrons at the Burial Chamber Haunted House complex. Fire extinguishers, a fire alarm and sprinkler systems, emergency exit signage and security cameras all help keep the attraction safe. 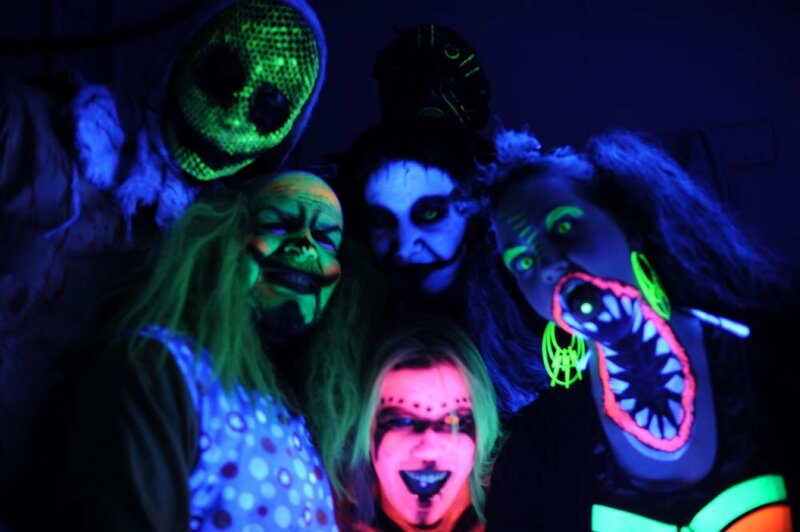 Billed as a massive outdoor haunted attraction located deep in the woods, Fear Town Haunted House nonetheless takes patrons on a journey in and out of run-down buildings. Aside from staying on top of obvious hazards like jagged edges and elements that could potentially trip people, Quill’s mandate is to always have a plan so that if people need to get out, they can do so quickly. “If you can get all your staff members and customers out of the attraction in a short amount of time safely, then you can prevent what might be a small issue from becoming a much, much larger one,” he said. Staff are trained to constantly be on alert for changing conditions in their assigned areas. “We design everything with safety in mind but our actors are our eyes throughout the night, making sure it remains that way and no issues arise. It’s definitely okay for an actor to break character and take care of a customer or customers if they’re having a problem or if there’s some sort of injury,” he added. A line at the Burial Chamber Haunted House. Management has the ability to insert themselves into any of the attraction’s mazes at a moment’s notice, courtesy of many secret entry points, should a problem arise. Given that haunted attractions inspire unpredictable behavior in patrons, there’s a very real need for management to be concerned about the safety of their own staff. Actors at Burial Chamber Haunted House Complex in Neenah, Wis., are trained to protect themselves by employing the hula hoop method. “We instruct them to imagine they have a hula hoop attached to their backs. The circumference of a hula hoop is a safe distance to keep between themselves and patrons when delivering a scare,” said Owner Matt Mars. He also trains actors to never approach patrons head-on in the course of doing their job. “It’s best to come at customers obliquely or from behind while attempting to scare them because often when people are confronted, their natural inclination is to strike back.” A sign at the attraction’s entrance cautions “Punch our actors, go to jail” lest patrons think common laws of the land don’t apply in a haunted house. Mars believes the warning has really made a difference. Routine inspections are a key component of preventing guest injuries at haunted attractions. Burial Chamber conducts them on a daily basis. Every staff member is responsible for checking their own area followed by management going through again with another set of eyes. Any problems – for instance, a loose screw or a jutting portion of a set – are addressed prior to doors opening for a new evening of chills and thrills. Stock-in-trade safety tools complement human efforts. Fire extinguishers are positioned every 75 feet, there are fire alarm and sprinkler systems in place, plus emergency exit signage and security cameras evident throughout. Management also has the ability to insert themselves into any of the attraction’s mazes at a moment’s notice, courtesy of many secret entry points, should a problem arise. Since there are very stringent fire safety rules regarding haunted houses, anyone considering building one should first check local codes and ordinances and speak with their fire marshall. “We want it to appear scary and dangerous but in reality, a haunted attraction should always be very, very safe,” said Dwayne Sanburn who serves as the creative director at 13th Gate Haunted House in Baton Rouge, La. The southern attraction flame retards everything from costumes to curtains to wood. Sanburn and his team also work with the fire marshall during the design phase establishing pathways of egress so guests can quickly exit in case of an emergency. Naturally the facility has the requisite smoke detectors, monitored fire alarm system and sprinklers in place. In addition, the fire marshall arrives nightly to do a quick inspection just in case staff might have missed something in the course of their own walk-through. 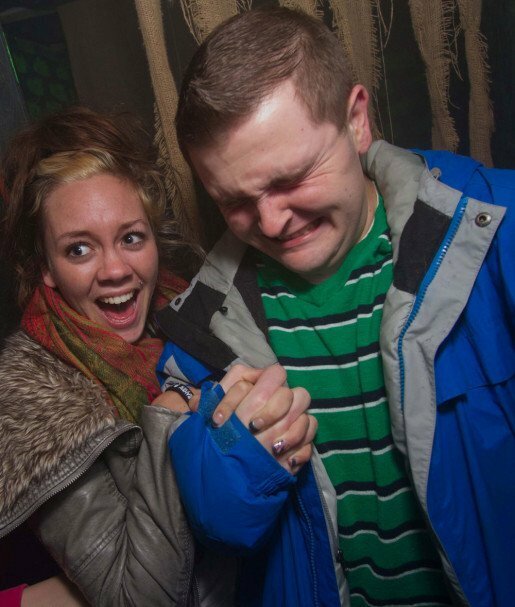 The 13th Gate Haunted House always instructs its actors to “scare customers forward”. It’s all part of the process of training them on proper scare techniques, one of which is the importance of keeping an arm’s length between themselves and customers, especially those who appear very frightened. “Fear is interesting. It conjures up the fight or flight mentality in people. Some will certainly lash out at you if they feel too threatened,” said Sanburn. Jumping out in front of someone might or might not prompt such a reaction but it will, in all likelihood, cause them to stop which in turn creates a back-up in the line of people coming through. People could bump into one another in the dark plus it interrupts the flow. The better plan is for actors to approach customers from an angle and “scare them forward” as Sanburn suggests. This will help keep things moving smoothly, or at least as smoothly as one can expect given the environment. Fire hazards and weather-related conditions top safety concerns at the Haunted Mansion in Wisconsin Dells, Wis., according to Co-Owner and Operator Sarah Wolfram. “If ever we have severe weather, our employees are instructed on what to do to close off the attraction and keep people inside,” she said. Since the structure is a cinder block building with cement cork board ceilings, it provides more than adequate shelter from tornadoes and harsh thunderstorms in addition to being quite fire resistant. 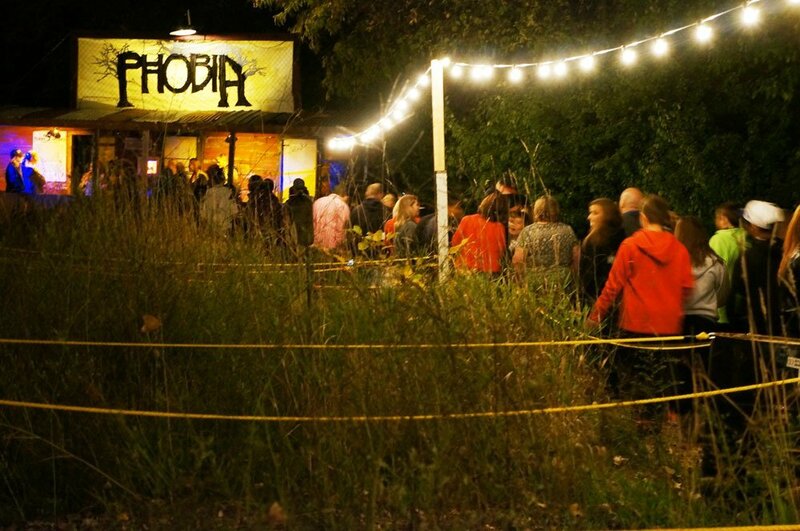 At the Burial Chamber Haunted House Complex in Neenah, Wis., staff members are taught how to keep themselves safe from sometimes unpredictable guests. The Haunted Mansion staff conducts two walk-throughs daily, checking for carpet snags, hanging cords or things sticking out from walls – anything that might obstruct the path of people making their way through the attraction. Unfortunately, a certain amount of customer mischief is inherent to the trade – sometimes people will pull down props and mess with them, said Wolfram. So while staff are trained to know where the emergency exits are and to make sure they’re open at the beginning of each shift so people can get out – they’re also trained to make sure the same emergency exits are locked tightly at closing so people can’t get in. 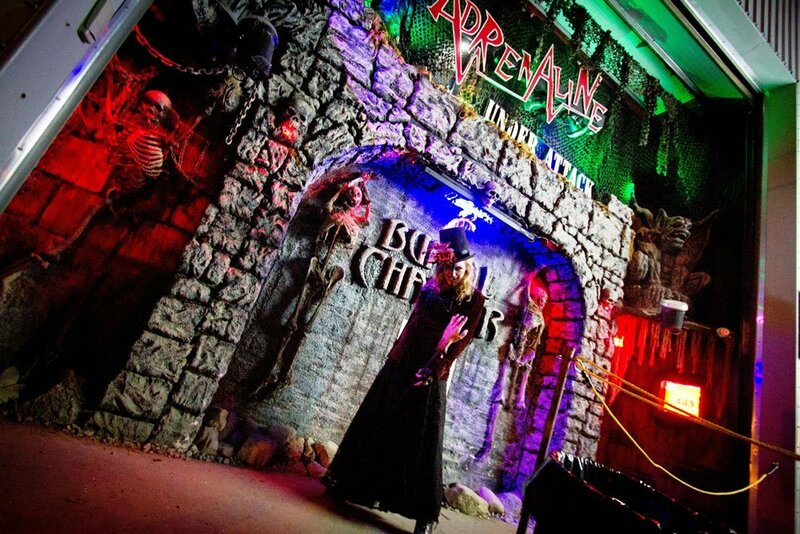 “We make sure staff are very familiar with physical layout of the haunt,” she concluded. A little prevention goes a long way when it comes to safety.